Home » Play » Activities » Moosehead dude cycles into Bandra! Moosehead dude cycles into Bandra! Anyone who has wandered around the streets of Bandra can’t help but stumble across some rather remarkable art on building walls, hidden along winding lanes, tucked away on the corner of a convenience stall. This one was immediately a favourite! There is something so quirky and appealing about this crazy guitar and fish totting bicycle dude that I can’t help but smile every time I go past it! Created by German illustrator Dome, it is entitled ‘Coming Home’. 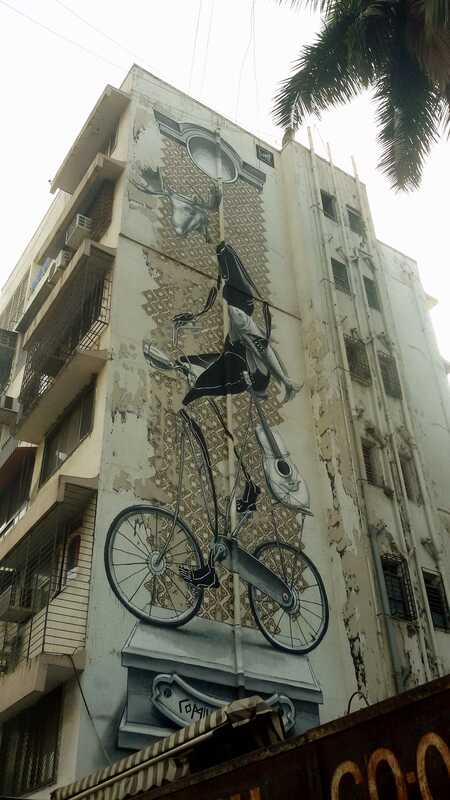 If you are swinging through Bombay, you can find this mural at Diamond Arc Building on Saint John Baptist Road, near Salt Water Cafe, not far from Mount Carmel Church in Bandra Reclamation. By Carissa Hickling in Activities, Every day, Urban Village on February 1, 2015 . There are some really fab ones just a short walk from our home. I really should get a camera to take snaps not just my lil phone camera on the fly! Love cool bicycle moosehead dude! And love this little peak into a Mumbai I never knew existed, or would have thought of.